“ I hope our research can have a valuable impact on many generations to come”, said Mr. Michael Lutz (General Manager of PT Volkopi Indonesia) to Sabam Malau. The signed MoU (Memorandum of Undestanding), click page The Lake Toba Coffee Research Initiative (LTCRI) Project. Picture 1: Michael Lutz and Sabam Malau discussing at Lutz’s office. Photo taken on 12 September 2011. PT Volkopi Indonesia is member of VOLCAFE Group, the Coffee Division of ED & F MAN which is a very famous, credible and one of the world's leading coffee merchants. The Head Office of ED & F MAN's coffee business is in Winterthur Switzerland. Dr Sabam Malau is the Chairman of NSCF-North Sumatera Coffee Forum. 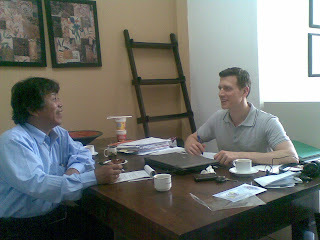 Sabam Malau and Michael Lutz met and discussed in a friendly atmosphere on 12 September 2011 at Volkopi Indonesia’s office at Jalan Pelajar Timur Gang Sempurna 15 Medan, North Sumatra, Indonesia. Both agreed to continue good relationship, and decided to start a new form of cooperation. Both established collaboration in coffee breeding research to develop and find new genotype (variety) that will be resistant to Coffee Berry Borer (CBB). The cooperation is starting since 12 September 2011. Clik “Coffee Breeding by PT Volkopi Indonesia and NSCF” to read the brief explanation about this research. Sabam Malau discussed also with Eko Purnomowidi (Manager) and Uden Banu (Quality Manager) and Vo The Hien (Production Manager at Dak Man, Vietnam). I was very impressed by their professionality and competency in doing their jobs. Picture 2. 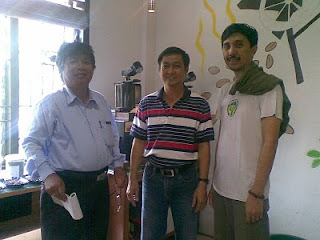 Sabam Malau (left), Vo The Hien (center) and Eko Purnomowidi (right) standing in the Laboratory of PT Volkopi Indonesia in Medan. Picture 3. Michael Lutz (left), Eko Purnomowidi (center) and Uden Banu (right) doing C-Test. They do C-Test regularly at this Laboratory of Volkopi Indonesia in Medan to ensure that only the best quality of coffee bean will be sold. 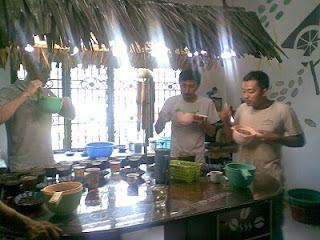 At that laboratory, I drank Blue Batak Coffee which was very delicious, fragrant, special and specific. The Blue Batak Coffee is a great coffee. On 9 September 2011, Sabam Malau visited Volkopi’s Station at Sigumpar. Sabam Malau was very impressed by Volkopi’s staffs at Station Sigumpar such as Mr. Roberto Cardona (Chief Agronomist, Alumnus of University Zamorano in Honduras), Ms. Mita Sihombing and Mr. Eman. They are professional: they know what they must know, and they know how to do it, and they can do it. Picture 4. Sabam Malau, Roberto Cardona, Eman, and coffee farmers (B Sihombing, R Purba, L Sihombing) discussing in front of coffee farmer’s house locates 20 meter from their coffee field. Picture 5: Ms. Mita Sihombing, a professional field staff of PT Volkopi Indonesia at Sigumpar Station, explaining the Broca Trap program. Picture 6. Broca Trap. This coffee farmer is facilitated and assisted by PT Volkopi Indonesia in fighting CBB. At this coffee field, I found a very few (insignificant) incidence of CBB attact. Congratulations to PT Volkopi Indonesia !! Those all mentioned above indicate that PT Volkopi Indonesia sells only the best bean of coffee from North Sumatra Province of Indonesia. Salute, Bravo, congratulations and celebrations ! !